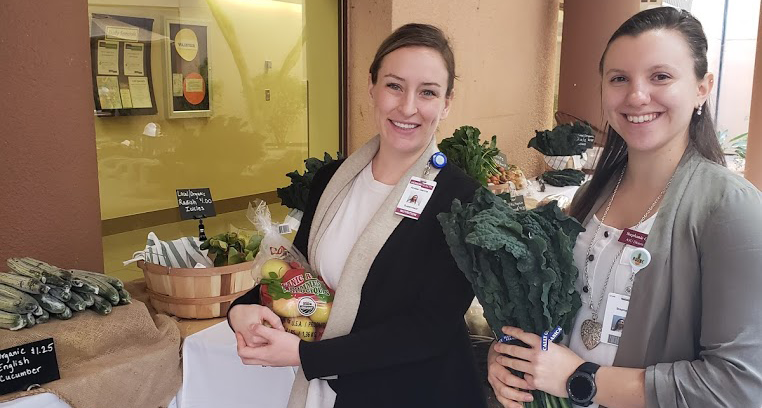 Each week from 11 a.m. to 1 p.m. patients and staff members can go to any cafeteria in the HonorHealth hospital network and purchase organic, seasonal produce accompanied by healthy recipe inspiration from a nutritionist. The new farm stand program serves an average of 50 customers each week. The benefits are multifold: improving healthy food access, strengthening local food systems, and creating an engaged workforce. "The support of the food and nutrition service staff has been instrumental to the farm stand program." In Arizona, a state where one in five individuals is food insecure and that ranks third in the nation for childhood food insecurity, HonorHealth has a strong organizational focus on healthy food access. The farm stands are the health system's most recent advancement toward this goal. Desert Mission, the community service arm of the HonorHealth hospital network located in Scottsdale and Phoenix, Ariz. is constantly innovating new programs and projects to improve factors that affect community health. Desert Mission operates a food bank that sits on the HonorHealth John C. Lincoln Medical Center campus, connecting patients who screen positive for food insecurity to several free and reduced-cost food programs, nutrition education, and resource and referral services. Anne Costa, Desert Mission nutrition outreach lead, organizes and runs gardening classes and cooking demonstrations – and most recently started the Desert Mission Farm Stand program. Costa partnered with the food services department at each of the six HonorHealth hospital campuses to reach as many patients, staff, and visitors as possible. Using Stern Produce’s Arizona Fresh Program, the hospital is able to source Arizona-grown produce and goods from farms and local businesses across the state to supply the farm stands.